The Defi-Link ADVANCE CR series is Defi's latest and most progressive development in gauge technology to date. Defi-Link Meter Advance CR gauges utilize Defi's next generation, Defi-Link Advance Control Unit (required for installation) for ultra precise monitoring and interaction. Defi ADVANCE CR gauges are designed around an ultra accurate microprocessor controlled stepping motor that will self calibrate each time and has a 270 degree sweep allowing for the highest of output accuracy even in the most demanding of vehicles. The Defi-Link ADVANCE CR system has adpoted an interactive communication system with the control box allowing for data to be sent to and from each unit for warnings, peak values and constant high speed reactive data to be fed to each individual gauge via the Defi-Link. Due to this interactive system, the Defi-Link ADVANCE CR system is not compatible with the older BF Meter series. Defi have incorporated a flat glass front and clearer value gradiaton in the gauge face for more accuracy and higher visibility in any condition. Defi have also designed the illumination system to be switchable between 2 colours via they latest L.E.D technology so the ADVANCE series system can be used in any vehicle. 2 different colours can be chosen from. 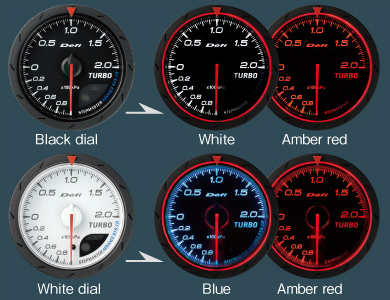 Black faced gauges can switch between white and amber/red illumination at night. White faced gauges can switch between blue and amber/red illumination at night.